Hungary became an independent republic at the end of the First World War. In March 1922, the Office of Works bought the large house at 1 Verboczy Utca (later Táncsics Mihály Utca), once the palace belonging to Count Batthianyi, from Baron Francis Hatvany for £6,500. The involvement of the Secretary of the Office of Works, Sir Lionel Earle, in this purchase is described in Room for Diplomacy p. 169. The palace was built in the mid-18th century to a U-shaped plan, remodelled a few decades later with a late-Baroque street facade and a fourth wing to enclose the central courtyard. The building occupied the whole of its site apart from a small garden beside the castle wall to the east. The house had a rusticated ground floor, a pilastered first floor and a tall roof containing a third floor. The legation offices and minister’s guest bedrooms were on the ground floor; the main reception rooms, including a ballroom or large salon, and the minister’s family rooms were on the first floor; and, rather surprisingly, the kitchen and ancillary rooms were on the third floor. A lift was installed five years after the house was first occupied. During the Second World War, Carl Lutz, the vice-consul of the by-then protecting power, Switzerland, lived in the house and used it as one of the bases for his rescue of thousands of Jews. It was extensively destroyed and looted in January 1945 during the Soviet siege and was full of squatters when the British military mission arrived. It became known as the Var site, lay in ruins throughout the 1950s, while intermittently regarded by London as the preferred site on which to build new offices and residence, and was eventually ceded to the Hungarian authorities in the mid-1960s. It was reconstructed throughout the 1960s, with great respect for its historical importance, and the courtyard was covered to create a large exhibition hall. The building is now the headquarters of the National Office of Cultural Heritage. A brass plaque in honour of Carl Lutz was placed beside the main entrance in 2012. The acquisition after the Second World War of a new residence and new offices is described in Room for Diplomacy pp. 262-4, and the saga of the British government’s claim for war damages at pp. 254-5. During the Soviet invasion in 1956 all staff families and the British community spent an anxious few days in the legation building before their evacuation by road to Vienna on 2 November. 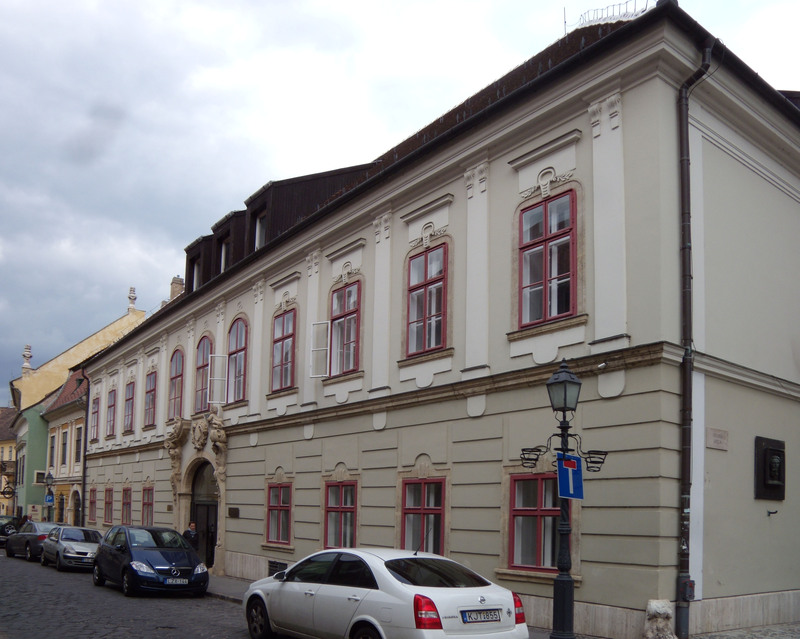 In the same year, the Hungarian state, in the shape of the Diplomatic Services Offices (DTEI), became the building’s owner and the lease was put on annual terms. In 1963, the status of the mission was raised from legation to embassy, and the British Council was allowed to return after more than a decade’s exclusion. The condition of the building had been worsening but the Foreign Office was reluctant to spend money on it while it was held only on annual leases. 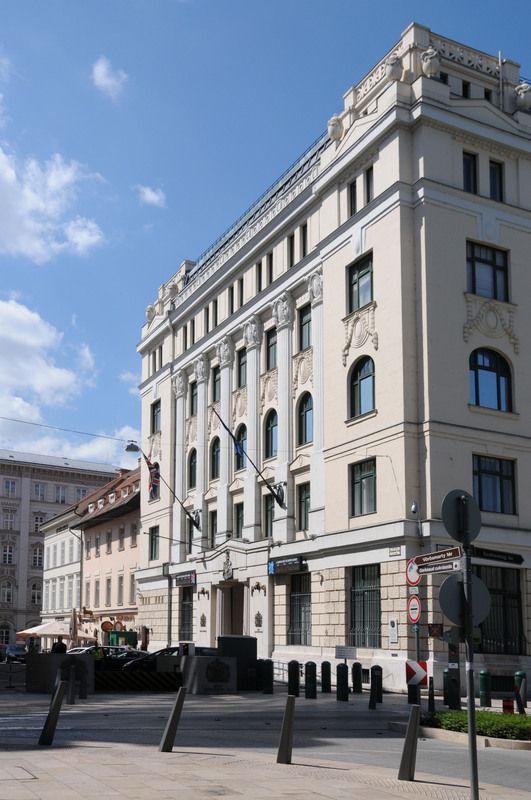 The opportunity for long overdue refurbishment of the building occurred with the arrival of a non-communist government in Hungary in 1990 and the agreement of a 25-year lease from January 1992. Work on the ground floor, including a splendid restoration of the banking hall, was completed in 1993 and opened by HM The Queen on 7 May. Work on the upper floors was completed in 1995: both phases were carried out by Higgs and Hill, working closely with specialist Hungarian sub-contractors. A marble plaque to the memory of Raoul Wallenburg was erected at the front in 2010. The former Hazai Bank Building, completed in 1914, leased as offices for the legation in 1947. The architect of the Hazai Bank building at 6 Harmincad Utca, Károly Rainer, described his design (in Hungarian) in ‘The New Building of Inland Bank Ltd.’ Building Industry: Building Art, Nos 12, 13 and 15, March-April 1917. 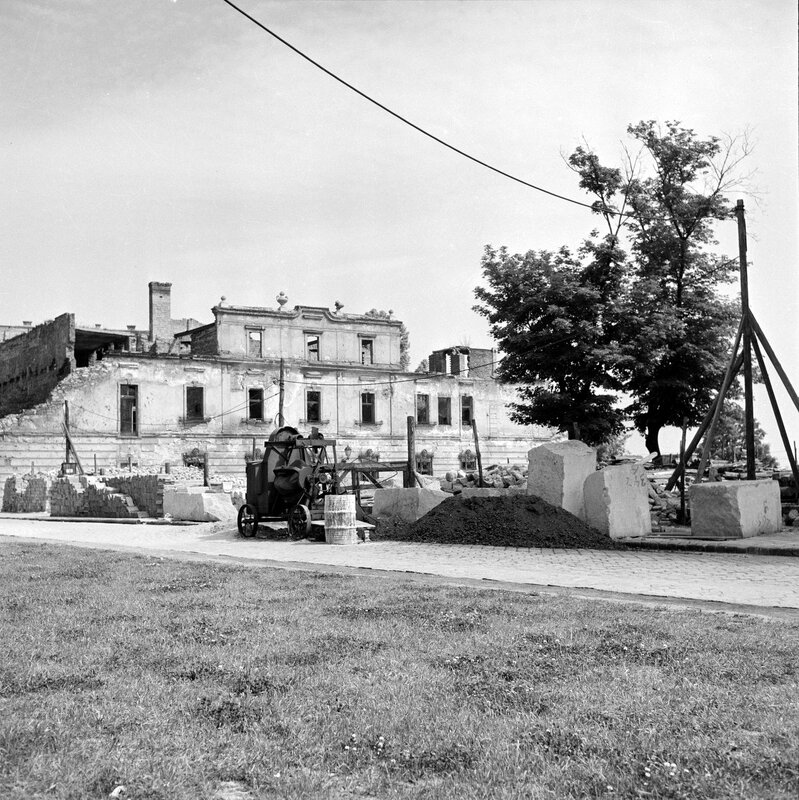 The legation building, destroyed in 1945, was rebuilt during the 1960s. 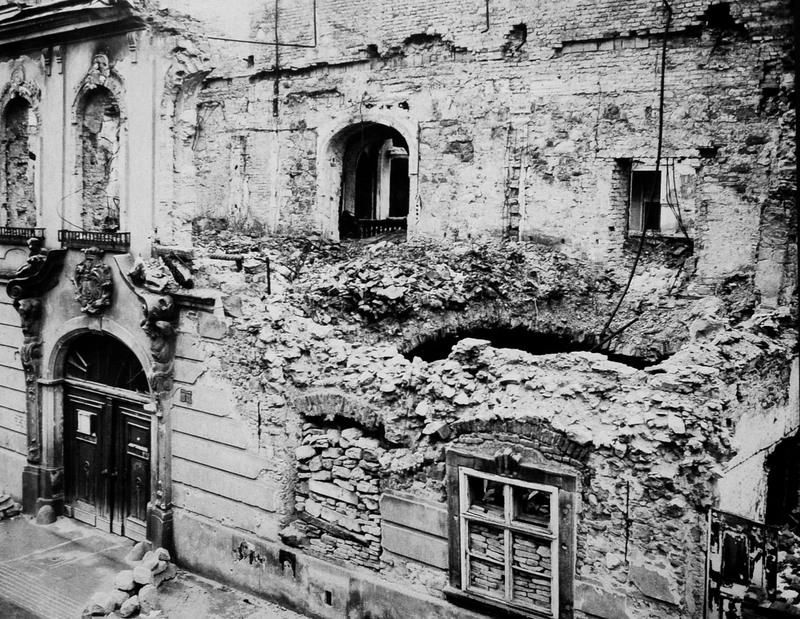 1945 damage to main facade. Still in ruins in 1961, the rear of the Vars site overlooking the Danube. 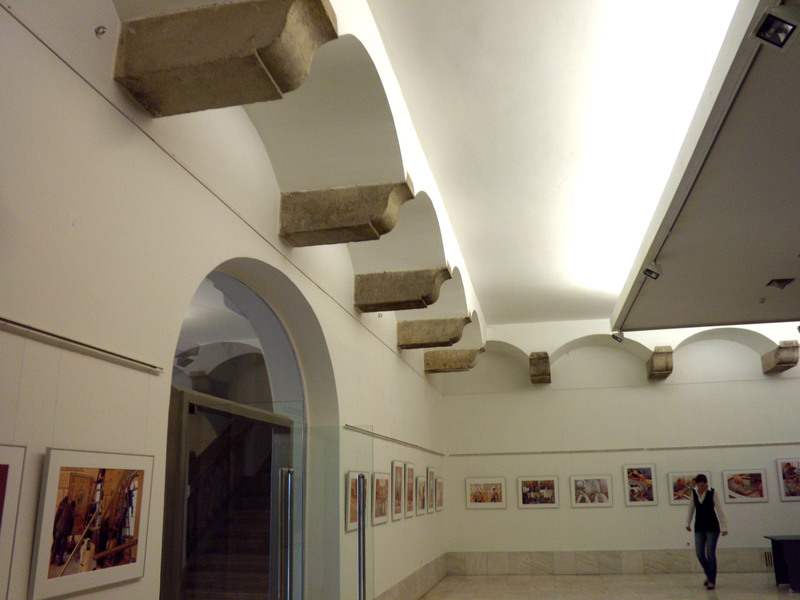 The present exhibition hall in the former courtyard. 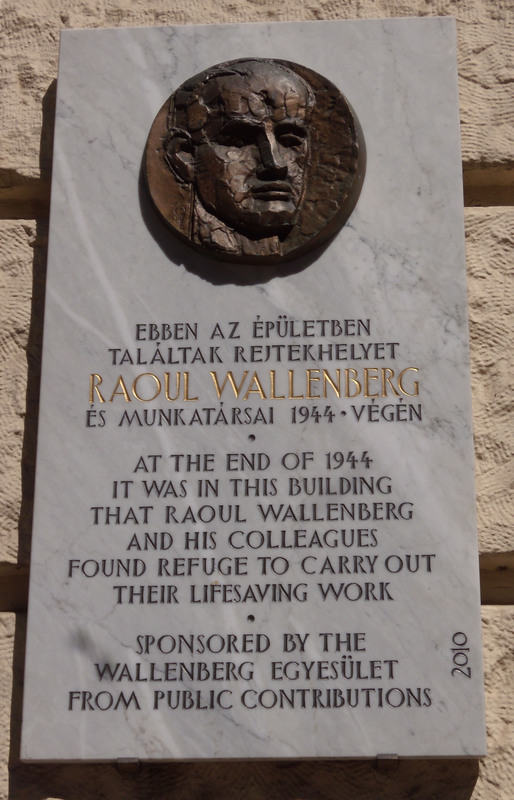 Plaque to the memory of Raoul Wallenburg on the embassy office building.